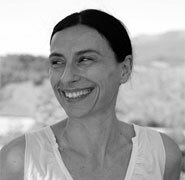 Inspired by her sister's enthusiasm for Ashtanga yoga, Maria Paola Stefani took her first yoga lesson in 1995 with the Italian maestro Lino Miele. For four years, she was a regular student in Lino Miele and Tina Pizzimenti's classes. Then in 1999, she began her apprenticeship with Lino at his encouragement. She assisted him during his workshops and retreats in Italy as well as in Kovalam, India, thereby acquiring a deeper understanding of the practice and knowledge of how to teach. Maria Paola left her job and started to teach Ashtanga yoga full time when the Ashtanga Yoga School in Rome opened in 2000. She is one of the founders of the school and teaches there every day. In addition, she continues as Lino's assistant, highly appreciated by fellow assistants and students. Maria Paola met Sri K. Pattabhi Jois twice, in Helsinki (2001) and in Mysore (2005) where she experienced his teaching in his own shala. In December 2009, Lino honored Maria Paola with a certificate verifying her more than 12 years of apprenticeship with him.